Redskins cornerback Chris Culliver might not be available in Week 5 to help slow down the Falcons passing attack led by Julio Jones. 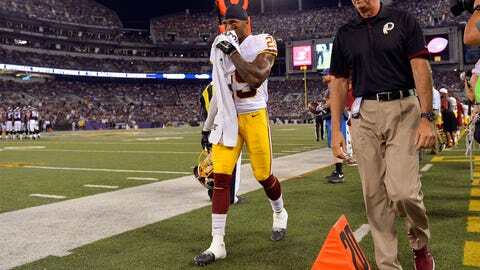 Washington Redskins cornerback Chris Culliver missed Wednesday's practice with a knee injury, and he will undergo an MRI on his troublesome left knee, per Mike Jones of the Washington Post. Culliver has dealt with a sore knee for over a week, but he played through it during the Redskins' Week 4 win over the Eagles. With other injuries to key defensive backs like Deangelo Hall, the Redskins cannot afford to lose another member of their secondary with Julio Jones and the Atlanta Falcons on the schedule in Week 5. Culliver went to have an MRI done on his injured left knee today.